The only gaff-rigged yacht in the world to fly a jackyard topsail on both the main and the mizzen, Thendara's rig is as rare as it is authentic. 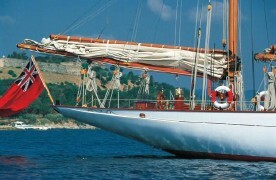 Her only concession to modern materials is the use of Dacron in her sails and lines. During her refit in 1993, traditional rigging expert, Harry Spencer of Cowes, constructed Columbian pine masts, spruce gaffs and booms, and rigged them with galvanised steel wire that is virtually indistinguishable from the originals. Southampton Yacht Services craftsmen went to extraordinary lengths to salvage and repair surviving fittings where possible, or re-cast new ones using the originals as patterns. The result is a highly original rig that also provides exceptional sailing performance in all conditions. Thendara's sturdy construction of teak planking on steel frames required some restoration during her refit, however an astonishing 70% of her hull is original. Sun damaged topsides were renewed and a brand new teak stern was created to repair a long forgotten crash. Steering problems required her warped wooden rudder to be substitute with steel, while some of the original steel deck fittings were substituted with new bronze replicas, and the original teak deck was replaced, with plywood laid underneath to make it watertight. 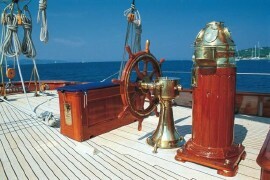 The original Thomas Reid anchor windlass was rebuilt using a hydraulic motor in place of the DC electric one, with the old steel drum ends recast in bronze.